This book investigates the iconic architectural cultural spaces of the contemporary cityscape as engines of regeneration. Promising much to their fading locales, these spaces locate culture in the space where production once ruled in order to revitalise post-industrial urban provinces. With close attention to four sites across the UK, Urban Constellations engages with the work of Walter Benjamin and Jean Baudrillard, to read these spaces and in so doing, offer a critical intervention into the theory and experience of contemporary cityscapes. Developing the notion of surface ethnography as a methodological approach to examining the form of cultural experience produced by urban cultural spaces, the author sheds light on the manner in which they transform cultural spectatorship, express wider political and ecological concerns and offer differing views to the ’native’ and the ’tourist’ in the construction of local history. The book also examines the decline of the idea that iconic projects can drive regeneration, in the failures and delays that can beset such undertakings. 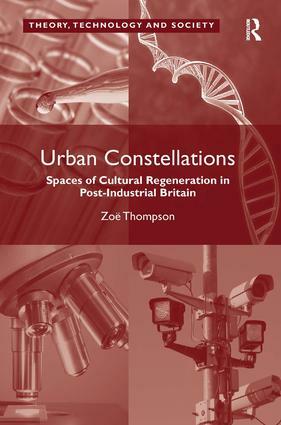 Offering a rich examination of the legacy of urban change in its most recent formulation - that of cultural regeneration - this book reveals the fragile potential of the spaces produced by contemporary ’dream houses’ and as such, will be of interest to scholars of cultural studies, sociology and social theory, urban studies, cultural geography and architecture. ZoÃ« Thompson is Senior Lecturer in Media, Communication and Cultures at Leeds Beckett University, UK.